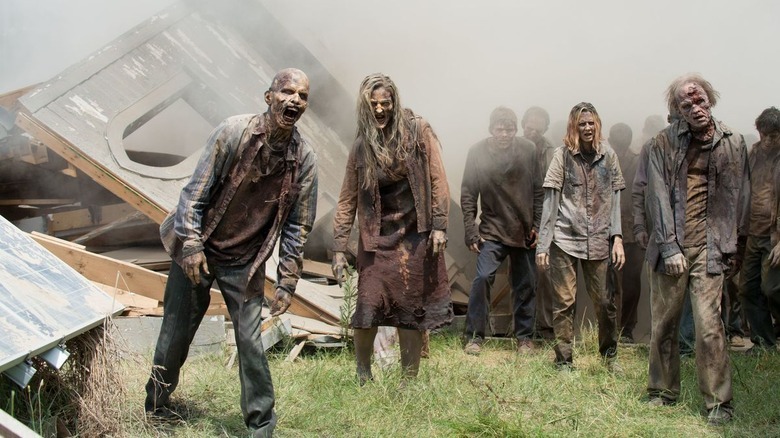 From classics like 28 Days Later and Dawn of the Dead to more recent hits like World War Z, Train to Busan, and the television phenomenon The Walking Dead, the entertainment industry has been pumping out zombie flicks for decades. 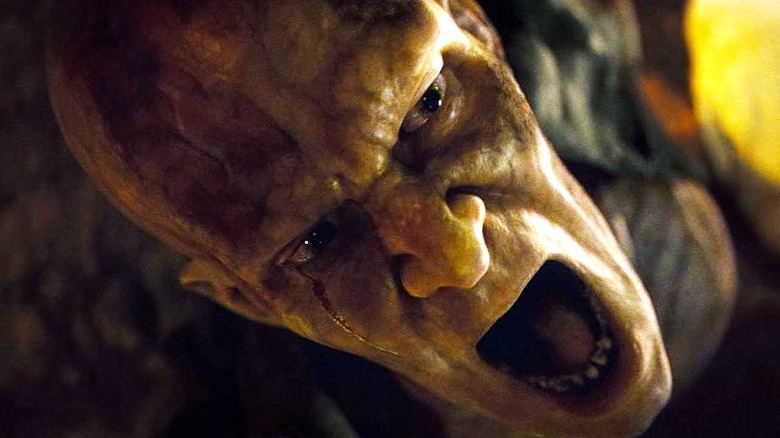 The grotesque antagonists that these films possess come in all shapes and sizes — quite literally — and have a fascinatingly diverse yet eerily consistent collection of traits that keep everyone on the edge of their seats. 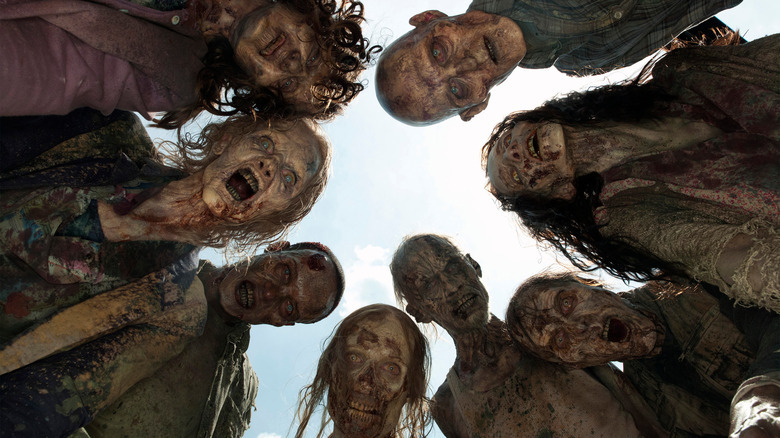 Contrary to your common archetypal villain, the walking dead are simplistic and animalistic, with their behavior culminating in a palpitatingly single-minded desire that makes them absolutely horrifying to have on your trail. And yet, as is often the case with apocalyptic thrillers of every hue, there are quite a few questions that most zombie flicks tend to leave half-answered or even gloss over entirely. 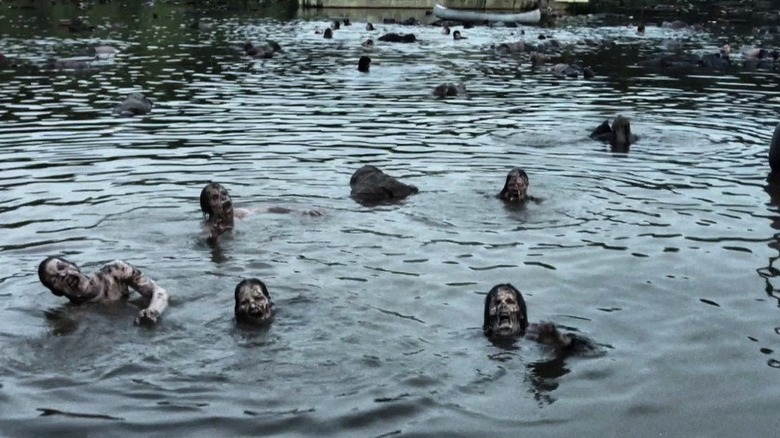 From strange appetites to oddly impressive abilities, here is an eclectic smattering of the most critical elements that zombie movies tend to simply leave unanswered. A reference to zombies immediately conjures an image of mutilated, rotting corpses smeared from head to toe with the blood of both themselves and their victims, hunting day and night, rain or shine, as long as they're still hooked up to that all-important brain. It's gruesomely disturbing, to say the least, but it's also a bit confusing. Sometimes a body will be shown days or weeks after an outbreak already mutilated and deformed beyond recognition. At other times, zombies that have been fermenting for years will still move around with the same pep and vigor that they had when everything hit the fan. Whenever a film constrains itself to a specific timeline, this idiosyncrasy can at least be contained. I Am Legend, for example, plunked the storyline three years after the initial outbreak and didn't go far from there, allowing for some continuity with the "Darkseekers" involved. But for shows like The Walking Dead, the issue of deterioration has truly become a challenge (it's not the only one the show's dealing with, either). As the years pass by, the question that naturally arises is how and why these things are still moving around at virtually the same rate as they did when they had just emerged in their zombified state. Another aspect of zombie anatomy that practically never gets addressed is how they living off of virtually nothing, seemingly forever. Sure, once they get their hands on a meal they act like they're famished, but if we're being realistic, they do that even when their stomachs are about to burst. So where's the rhyme or reason here? If eighty or ninety percent of a population is turned into the perpetually yammering creatures all at once, it stands to reason that all of those new mouths to feed are going to find manflesh a bit of a hot commodity, even in the first few days of chaos. How much harder will it be to keep some food in those bellies once they've gotten a few months or years into the future? And yet, there they are, shuffling around looking for a quick bite behind every door and overturned vehicle as if the apocalypse just started yesterday. And we're just talking about food here, too. What about water? How is that zombie blood still flowing in the first place? 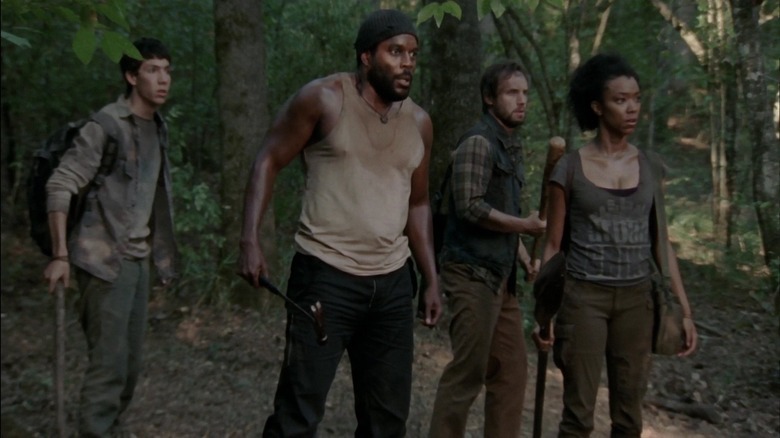 Once again, the nutrition question has become particularly poignant with long-running shows like The Walking Dead. Season 9 even exacerbated the problem by audaciously jumping forward by years between episodes more than once. 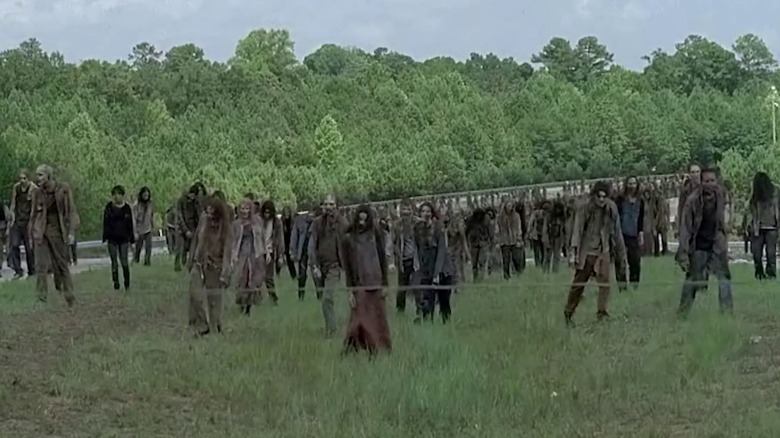 They made a few nods to the walkers slowing down, but seriously, how the heck are they even still moving at this point? One area where we find absolutely no consistency with zombies is their brain function. While their generally animalistic nature is a hallmark, the actual things that zombies can do span the gamut, with absolutely no explanation as to why. One zombie might be able to climb a set of stairs but not open a door at the top of it. Another might be able to dodge trees but splash right into a river without even noticing. This raises a puzzling question: how much brain function are these guys supposed to still retain? If they're technically "dead," how do they even have brain function in the first place? Assuming that they do indeed have said abilities, though, where do you draw the line? Take World War Z, for example. It has that famous shot where the hoard builds an undead ladder to scale the walls. That's not the kind of thing you do by accident. It takes at least a smidge of coordination… just saying. Here's one that we all just accept without question. Why on Earth does the zombie virus always make people want to eat their own kind? We're not talking about a desperate compromise on morals in order to survive an "adrift in a lifeboat" scenario, here. We're talking about a culinary preference like no other. However and wherever they get infected, it usually takes a matter of minutes or less before zombies go for the jugular of the closest homo sapien they can find. Where's the logic here? If they became overpowered by an uncontrollable urge to rush to the cupboard, yank out a box of Captain Crunch, and start chowing down like an animal with no table manners, we'd all get it. But the intractable hankering for human flesh is odd, to say the least. Add to that the fact that at times they literally sprint at their family-turned-prey all in a reckless effort to sink their teeth in for a snack, and the whole thing becomes ridiculous. Can we please get a little bit of clarity on the science behind this unexplained attraction? Okay, say we can somehow rectify — or, at the least, accept without explanation — why zombies are always trying to masticate on their own species. Let's take it even further and suggest that we've managed to accept that whatever virus or sickness infects them is what's driving them onwards in the interminable hunt for their human quarry. That still leaves one important element unaddressed. If they're always so desperate for food, why do they so often leave their meals half-finished? It seems like every time there's a downed human on the menu, the zombies come flocking to nab a quick bite or two before moving on in search of the next victim, all the while acting as if they've never had a meal in their lives. When several hundred zombies get their repugnant hands on a meal, even if everyone just took a single bite, there shouldn't be anything left by the time they move on. We're talking a bones-picked-clean kind of scenario here. Similar to brain function, the physical abilities of a zombie are neither consistent nor explained at any length in the vast majority of stories. Filmmakers simply give us a dose of what their zombies can do, and we're expected to just live with it. The only problem? The physical attributes of the creatures are all over the place. Sometimes they can sprint around like a gazelle or leap through the air with the greatest of ease. At other times they shuffle along, slow as a snail, depending on persistence rather than unbridled physical speed and daring. Whether they're the tortoise or the hare, though, zombies typically have quite distinctly different physical limitations to their livelier counterparts. Perhaps toning it down to a whimpering stagger implies their tired bodies are slowed to conserve strength. On the flip side, cranking it up to a mind-numbing frenzy may indicate that the sickness has maddened them. But the question still remains… why? We may never know. 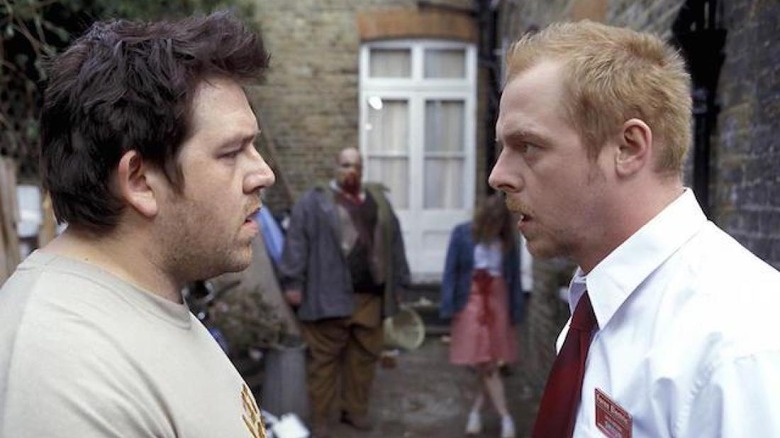 All we do know is that the parodical scene in Shaun of the Dead when the zombies take forever and a day to reach their victims is pretty spot on. Apparently, when humans lose their ability to think reasonably (e.g. we die and become zombies), our innate reaction is to bunch up into herds. At least, that's the takeaway from a variety of zombie flicks. While the occasional solo walker shows up from time to time, the serious threat always arrives when that giant group of living dead stumbles onto the scene, creeping like a wave across the landscape and swallowing up everything in its path. 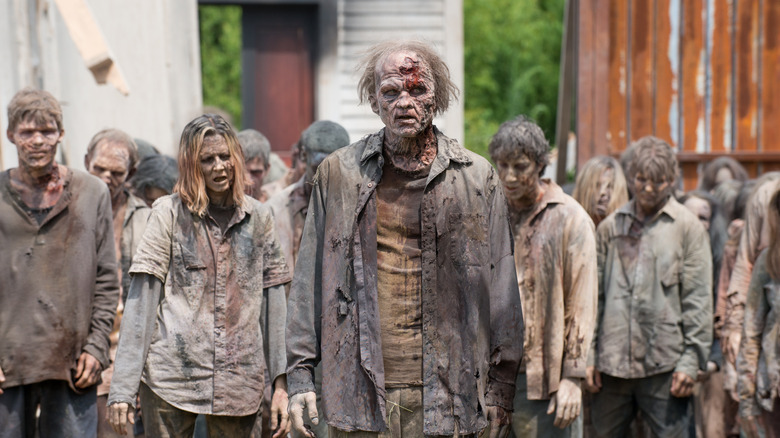 Whether it's a small, intimate group or a mega-herd, though, the question remains — why is this the natural behavior of zombies in the first place? It's not like they're getting more food that way. In fact, the enormous number of mouths to feed almost ensures that they'll be going hungry most of the time. 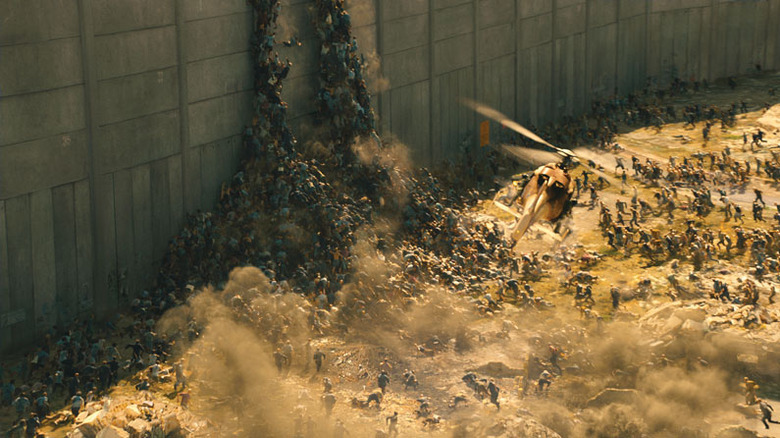 And yet, the fact still stands that whether it's those elite cloistered pockets of creatures in I Am Legend or the horde that catches the group at the carnival in Zombieland, herds are a distinct feature of zombie cinema, with most cases giving us hardly a word of explanation as to why this is the case. How do island nations fare? Let's shift our focus for a second from the dead to the living. At their root, zombies are a classic medical scare, with uncontrollable outbreaks and horrible symptoms spreading over time. Some shows like The Walking Dead do away with the whole quarantine issue by just making it a blanket sickness that everyone contracts after a certain point. 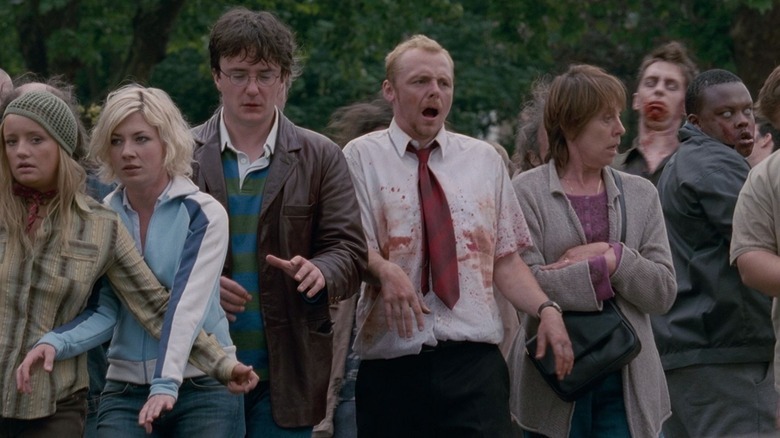 More often, though, containing and controlling the outbreak is a core element of a zombie film. Just look at Quarantine. With that said, if an outbreak "goes viral," affecting continents and eventually the entire globe, one question that's stuck in our craw is what happens to those who live on islands. It's easy to rule out the bigger players like Great Britain (28 Days Later literally takes place on the island nation, after all), but what about smaller, more out of the way locations? Does Hawaii get infected, or does it remain an island paradise? How about Madagascar? What about small, private islands owned by millionaires? Another element that never ceases to amaze is the way that "other" groups of survivors (in other words, characters who aren't critical to the storyline) show up only to be killed off, one by one, as if they're apocalypse newbies. Whether it's a long-running, multi-year show with hundreds of hours under its belt or a 90-minute one-off flick, it's often only too easy for the audience to say goodbye to the new blood as their primary interests remain firmly ensconced with the protagonists. But the question that begs to be asked here is why, every time a group of veteran survivors shows up, they always end up being inferior zombie survivalists? They made it as far as the protagonists, after all. And yet, one of the classic plot devices is to usher in a fresh group of victims that managed to survive weeks, months, or even years in a zombie-infested wasteland, only to see them make bone-headed mistakes that lead to their demise as quick as you can say Bob's your uncle. Can someone please explain why zombie movies propose that once we become dead, our hearing becomes superpowered? Numerous films depict undead antagonists that, while not particularly motivated by evil, are able to detect the presence of their victims at the slightest sound. The question is, how are their human eardrums suddenly fine-tuned to such an extraordinary level? Living, breathing humans are bumbling creatures at our best. The sudden acquisition of a cat-like ability to hear a pin drop is a bit uncanny. And then there's their impressive ability to sneak up on victims, in spite of the fact that they're constantly babbling and slavering loudly enough to warn even the densest doomed human of their approach. Depending on the scene, a zombie might make their approach known a mile away or they might jump out from a corner at point blank range. And all of this with zero predictability of one or the other scenarios taking place. This singular ability to actively mute their gurgling, grunting, and shuffling is nothing short of astonishing. 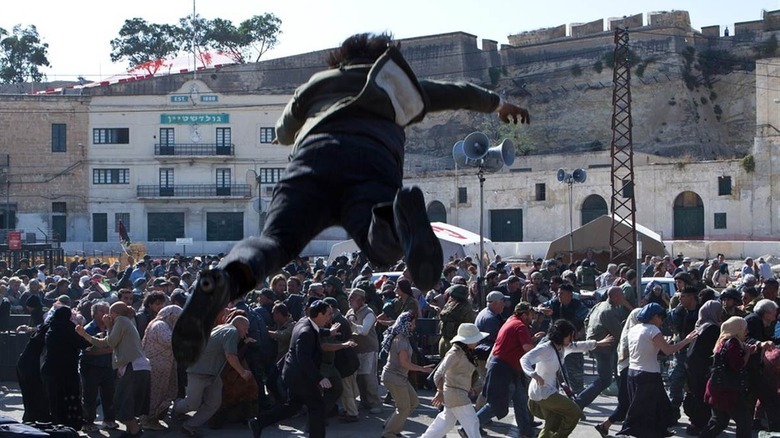 Often the genesis of a zombie outbreak will be briefly explored within a storyline, but the popular way to get things going is to pull a Rick Grimes, sit out the early fun, and dive into the chaos once things are fully rolling. The concept of how an outbreak would actually take place is often not even really addressed outside of a first-person perspective. Sometimes this is accompanied with a hushed secrecy, as if the government stepped in to keep everything pin-drop silent until it suddenly got out of control and the civilized world instantaneously collapsed. This works for films that came out before the social media era, but anything set beyond Zuckerberg needs to start taking Facebook and Twitter into account. Let's be real here — if someone went off and started eating their friend or co-worker's face, you can bet your bottom dollar that some other nut is going to choose to whip out their phone and record it, rather than run for their lives. That said, then, the idea of an apocalypse occurring at this point without being fully and quite thoroughly heralded by social media is quite ridiculous. We're all familiar with the look of a zombie covered in human blood, especially after they've dispatched a victim. No one bats an eye at the thought. After all, their meals are pretty intense. But what about the reverse situation? Zombie film fans are also perfectly accustomed to seeing human survivors bathed in the blood and gore of the once-living dead as they fight their way out of harrowing scenarios. 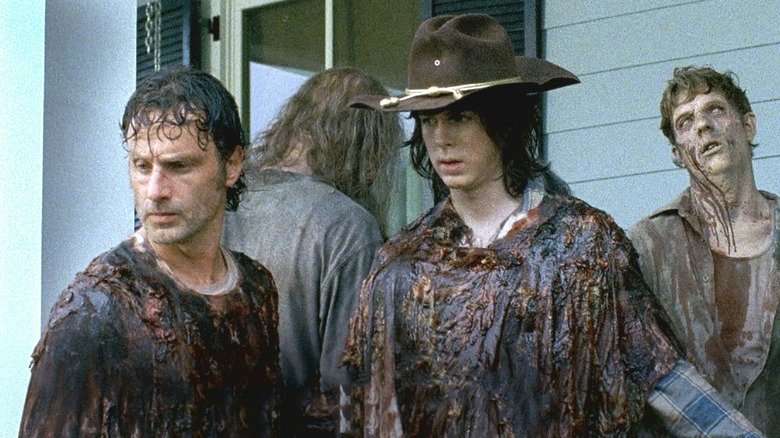 Heck, The Walking Dead has literally had their heroes cover up in the wretched stuff on purpose in order to help get through zombie hordes undetected. But, of course, every time a character gets that gore all over their person (particularly their face), we all start shouting at our TV sets for them to keep it out of their mouths. After all, a zombie bite is almost always fatal, and eating infected flesh can also be a problem. Heck, a scratch can even be a health hazard. So why on Earth do they think getting zombie blood all over themselves isn't going to get them infected as well? Purposeful application aside, even just smashing skulls has got to get some of the infected blood splattered everywhere. How does this not infect anyone? Hello? Can we get an answer here, please? The biggest question that every zombie movie in history has failed to answer is why we like these films so darn much in the first place. Where's the attraction? They're disgusting, gory, and all-around disturbing. The villains have no depth or complexity of character — in fact, quite the opposite. Sure, it's interesting to follow the protagonists as they attempt to survive an apocalyptic scenario where civilization has collapsed and they've gone from the hunters to the hunted, but still… why the zombie? What is it about those abominable, fundamentally unsettling flesh-eaters that makes us return for more and more of the same nauseating concept? Is it the fantastical possibility of a real-life zombie outbreak that horrifyingly mesmerizes us for hours on end? Or is it some other, less definable motivation, akin to the apparent desire for the undead to herd together and eat human flesh, that keeps us coming back to the zombie well? One thing's for certain — it'll be a cold day in hell before the zombie films manage to definitively answer that one.